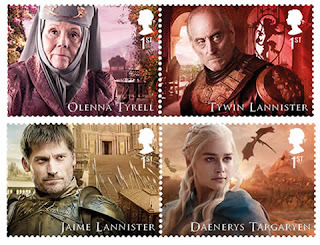 The Game of Thrones will appear on a new collection of stamps to celebrate Britain’s contribution to the fantasy series. The Royal Mail is releasing a brand new line of stamps that includes 10 characters from the major houses, including House Lannister, House Stark, House Targaryen, House Tyrell, One of the stamps features an image of the series’ famous Iron Throne. An additional five stamps feature non-human characters, including dragons and dire wolves, as part of the series which will be available from January 23. Highlighting the prominence of British stars among the cast, the stamps feature actors Kit Harington, who plays Jon Snow, and Emilia Clarke (Daenerys Targaryen) among others. Nikolaj Coster-Waldau, from Denmark, and American Peter Dinklage are the two actors included who hail from elsewhere. The television series has won 38 Emmys, more than any other fictional show in history, and one Golden Globe award. “Game of Thrones” is also a nominee for best drama series at this year’s Golden Globes.